We know just how much you love map murals, so we’ve updated our collection with new designs from mapping company, Lovell Johns. To launch our selection of new map murals, we thought we’d blog about how to style a map mural. 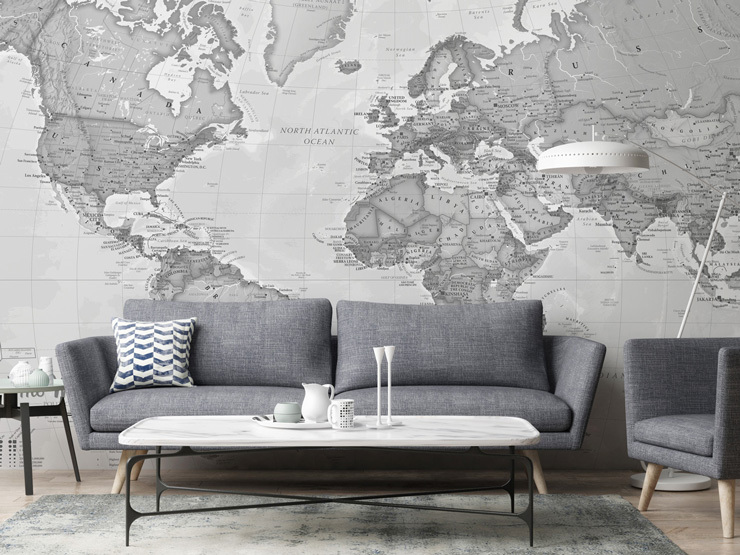 A stunning way to give your home a timeless restyle, map murals are a popular choice to create wow-factor feature walls and statement ceilings! They're a great talking point for friends and family alike, the perfect inspiration for future travels or ideal place to plot all those globe trotting adventures you've already had. 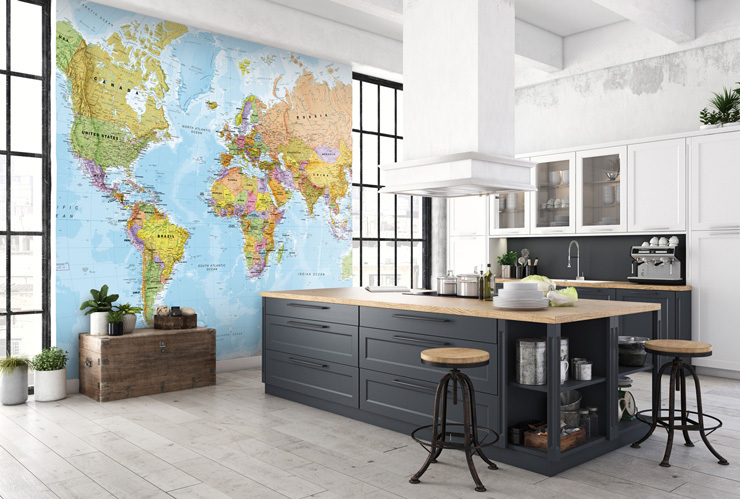 In our extensive collection, you’ll discover designs from neutral world maps, perfect for living rooms and kitchens, to funky, educational maps for children. With so much detail, we appreciated that styling a map mural can be daunting. Figuring out where to place your bed so you don’t hide your favourite country or using pictures to break up the ocean can be tricky. 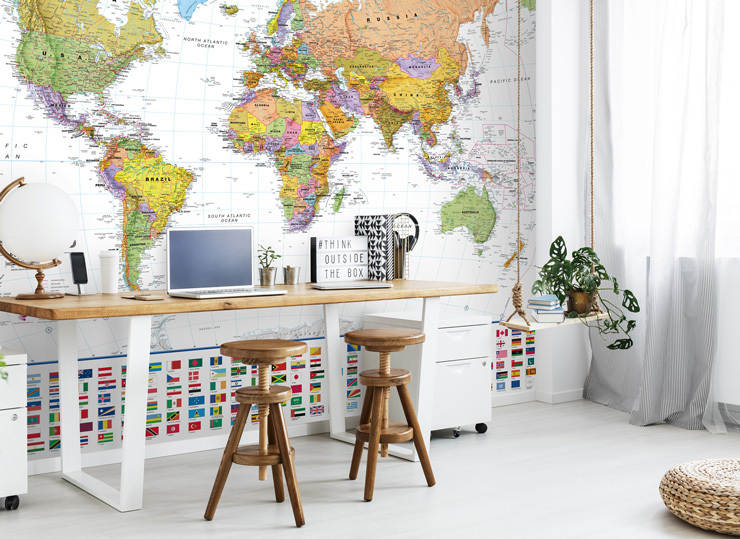 Read on to learn more on how to style a map mural. As all of our map murals are custom made to your dimensions, it’s important to be absolutely certain of the wall you’d like to cover. Plan where you’d like your furniture to go before placing your order. Accessories can come into play when the mural has been installed. Once you’ve entered your dimensions into your chosen map design, note that you can move the crop box that will have appeared over the image. If you’re planning to install your map behind a sofa or bed, consider moving the crop box to ensure that countries won’t be hidden behind furniture. 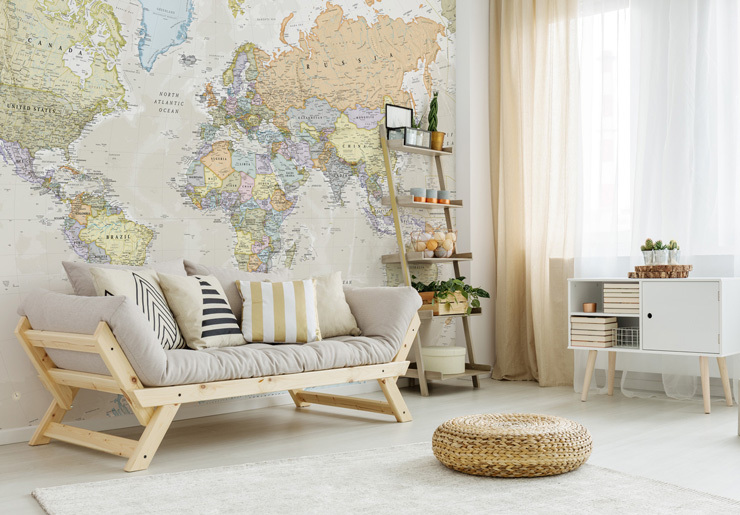 Once you’ve installed your map mural and the main pieces of furniture are in position, it’s time to think about accessorising your mural to bring your room together. Don’t be afraid of hiding parts of your map mural with accessories. This will help your map blend into your room without looking like it’s just been plonked onto the wall. Instead of hanging pictures on to your mural, prop them against the mural or use a ladder shelving unit like this one from Made.com. This way, if you change your mind or want to update your room, it’s simple without damaging your mural. For areas of your map mural that are closer to the floor and display a lot of ocean, for instance, consider a small coffee table or stool to break up that bare space. Another scenario for your map mural may be that you have installed it onto a blank wall and you don’t want to accessorise it. Instead, ensure your space is balanced. Make sure your adjacent walls have something going on them. Whether it’s kitchen units like in the above image or framed prints, this will help make the room feel balanced. Also, don’t give the mural space by placing furniture as far away as possible from it. The colours that you choose to decorate alongside it are what will make your mural ‘POP’ and stand out. You’ll discover an abundance of colour in our map category. From bright maps to pastel maps, we’ve created a category where there’s a design for every style. In particular, latest map murals consist of on-trend pastel tones. Pastels work really well with highlights of dark grey. Especially when it comes to your pastel map mural, hints of dark grey accessories will make the lettering and line markings pop out. Also teaming it with contrasting pastels, like this green-tinted rustic map mural with pink cushions, will give your room an uber-stylish finish. For bolder map murals, choose a cooler colour scheme with whites and natural tones to make the vivid colours pop out. Do you have any tips on styling your map mural? We’d love to hear them in the comments box below. Discover all of our new map designs from Lovell Johns in our map murals category.